A few days ago one friend on mine announced me that InternetworkExpert released a GNS3 configuration for their v5 topology. 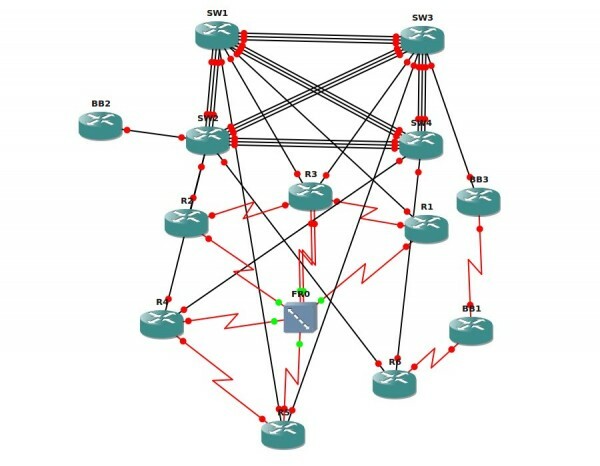 When I had check INE’s website, I could not found the link to GNS3 topology. To be honest I was expecting INE to announce with big letters this new development, but I was quite silent (or I’m not reading carefully enough their website). This is the file which you are looking for. Of course you need to edit and adapt it to your local configuration (IOS, path location…). What is different from Dynamips file? Almost nothing, but you have a graphical view of the topology and if you put your mouse over a link, you’ll see where is the connection pointing too. It can help you spare some time in the configuration, but there is a drawback. Don’t get used too much with this feature, as in the CCIE lab exam you don’t have where to point your mouse to show the connection and you have to figure it by your own from the paper (or lately computer screen). How-to is divided in 3 video tutorial parts for easy understanding and start with the most basic installation on GNS3 under Ubuntu 9.10 and continue with the actually configuration on the emulation. If you are interested in security or you just want to test ASA and don’t have access to real hardware you definetely will want to try Brainbump.net tutorial. 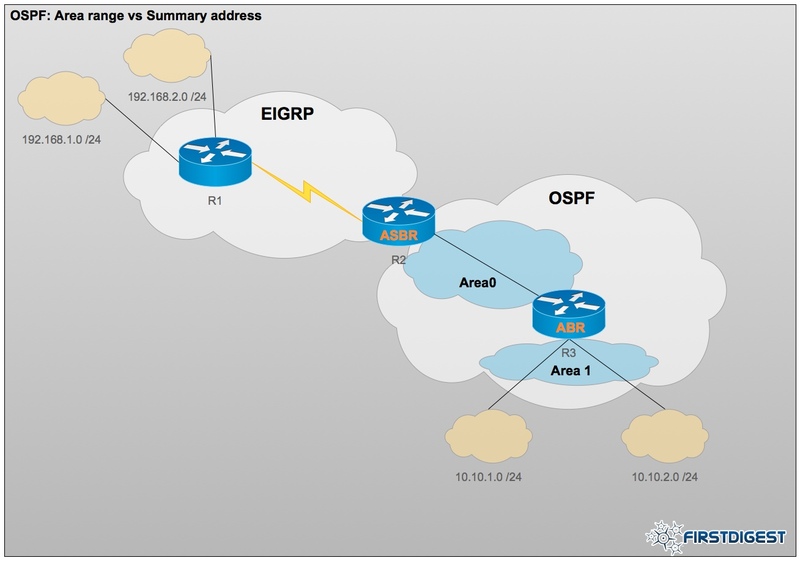 A ready made GNS3 topology, including 3 interconnected routers in different domains (EIGRP and OSPF) like in the topology below. Load the .net file in GNS3 / Dynamips, apply initial router configuration and you should have working scenario with OSPF and EIGRP routing. In this article I want to show you how to extend your posibilities to test a network in GNS3. Sure, it’s simple sometime to use a Loobpack interface on one of your edge routers to simulate an external network, but sometime is useful to have something connected to the router port. Take as an example QoS marking and classification. If you want to mark something inbound, then you need a connection to the router port where you want to mark the packets. Additional to my example here, which include Virtual PC Simulator, you can find useful tutorial about GNS3 and VMware integration on gns3-labs.com or how to emulate a voice lab with the same tools on blindhog.net. Even most of you are familiar with GNS3 and maybe Virtual PC Simulator, let me begin with some short description about this 2 software. GNS3 is a Graphical Network Simulator that allows emulation of complex networks. It allows you to run a Cisco IOS in a virtual environment on your computer (running Linux, MacOS X or Linux). GNS3 is a graphical front end to a product called Dynagen. Dynamips is the core program that allows IOS emulation. The Virtual PC Simulator (VPCS) allow you to simulate up to 9 PCs. You can ping/traceroute them, or ping/traceroute the other hosts/routers from the virtual PCs when you study the Cisco routers in the Dynamips. VPCS is not the traditional PC, it is just a program running on the Linux or Windows, and only few network commands can be used in it. But VPCS can give you a big hand when you study the Cisco devices in the Dynamips. VPCS can replace the routers or VMware boxes which are used as PCs in the Dynamips network. Before we start, I assume that you already have these tools installed. If not, please download and install GNS3 and VPCS. On the following example I will show you how to configure a network topology including 2 Virtual PCs and one router and how to interconnect them in GNS3. This presentation is simulate a basic network, but after you learn how to do it, you can configure more complex one. You can have a look to the topology to understand better what I’m talking about. GNS3 is an extremely useful tool if you are using Dynamips to emulate Cisco devices. It is a graphical environment in which even a newbie can do complex configuration by clicking and dragging routers, switches, connections into a topology that can be saved. The problem that occurred to me in the past (and maybe to you also) is the following. Let’s assume that we create a configuration with routers named R0 and R1 and you save the topology config and also the routers config (“copy run start”). All the files (GNS3 topology config and Dynamips files created for R0 / R1 saved config) will be put into the default GNS3 project directory (e.g. /tmp in Linux or other directory if you are using Windows system). For now it is perfect. You have everything fine. Next time when you start a topology, by default GNS3 will start with the same routers R0 and R1, and we you boot them, they will load your ex-saved config files, because GNS3 will look for config files into it’s default project directory, and since the name of the routers are the same, it will think that this have to be loaded. So, what you will do when you have 10 topologies that you save. Give all the time different routers name? Even so you will end with a mess in your default GNS3 project directory. I have a solution for this issue, that you might like. I’m not saying that I have discovered this solution…for sure there is somewhere out there on the Internet, but I think of it by my own and I said that maybe others will use it.